i was an apprentice electrician driving about in the late 80's with my boss and poor radio reception caused us to put a tape of his on and i was blown away when "Thunderin Hearts" came on and to this day that is still my favourite song of Johns. I was 8 and I remember hearing Hurts So Good that week John was on Solid Gold and I thought he was the coolest guy I had ever seen ,but I was 8.I still do think he is.I remember watching him sing that song on that show wearing that white shirt with the cuffs unbuttoned, I was so in love. I saw him at the Bluebird Cafe in Bloomington playing in a band called COPS (Cougar out playing secretly). He had put out his first album so this was late 70's I think. my favourite rock radio night program in provincial west germany used to play 2 songs to introduce an artist. some day in 1985 they played "jack&diane+lonely ol´night". the name of the singer to me sounded like the wild west, like america itself, the freedom i was seeking for. since that day john´s music has accomponied me through life. 1988 during the "lonesome jubilee" world tour, i got the chance to see him live for the first time. 91 i travelled to the usa for the first time and saw him in los angeles, one year later again in germany. since then i´ve been waiting for another european tour. hopefully there will be one next year. The first time I heard John I was 11 years old My parents had bought his Album at the time . It was 1978 I Believe I need a lover was on that album . But I really became a fan in 1983 I was 16 years old and was going thru the rebel stage and his music really hit home with me The Authority song and Jack and Diane Etc.............. His music was my escape from the troubles I was having with my parents . 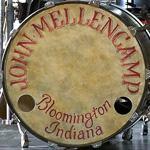 I have been a die-hard Mellencamp fan ever since. I have seen him in concert 6 times and have enjoyed every concert I have ever attended by him . Him and his band always puts on a great show . No matter who is in his band they still put on a great show . I must admit I really miss Kenny Aranoff at the drummer spot though he is such a talented drummer he really added a lot to the sound of the band . Anyway being a fellow hoosier i have always felt like I can relate to what John writes and sings about . I definitely share his political views Country Gentleman hits the nail on the head when it comes to the Bush Era .......... LOl thank God that is over Anyway Thanks John for everything you have given us in your lifetime please dont ever stop performing . Here I go dating myself again...I was 13 or 14 when MTV was huge. The first time I heard "Little ditty...." I was hooked on "Jack and Diane". I had to get a copy. So, I walked the 3miles or so to the 5&10 and tried to buy a 45, they only had the entire album! Curses, I'd have to spend way more than I wanted to, but I got "American Fool". There was no going back. He's been my favorite ever since. For years he was the only one I've seen in concert more than once, but that is no longer the case. I've seen him far more than anyone else though. Starting with the Scarecrow tour. Two arena tours, two amphitheater tours, and the minor league stadium tour. I'm pretty sure I was at the show that he had his heart attack. I won't lie, the first two were the best in a few ways that will never be again. He was younger and even though he still moves great, it was slightly more, you can't beat the '80's arena shows, and the biggest thing....back then he only had a few songs, so he played most of them, now, with so many hits and deep cuts, you are bound to feel like you wanted just one or two more songs....But, I took his advice and am still trying to 'hold onto 16' even though '17 has turned 35" and then some. I think it was the 80's and he appeared on The Tom Synder show. For all you young birds out there, this was a show that came on after The Tonight Show and Tom Snyder was introducing new talent. I heard him sing, Aint even done with the night and was awe struck and have been following him ever since. I am going to drive to Houston from New Orleans in April to see him. John’s first “real” album (John Cougar) was released the week I graduated from college (June 1979). That summer and fall I discovered John via his amazing “I Need A Lover” single which got a lot of airplay on Southern California rock stations. I got the album and was immediately hooked (it is still just about my favorite of all his albums – I especially like Sugar Marie, Night Dancin’, and Taxi Dancer). The week I started grad school (September 1980) at Berkeley, John’s next album came out (Nothing Matters and What If It Did). I played it endlessly, loving every minute of it (including the Peppermint Twist fade in). I also saw John on Tom Snyder’s late night show that a previous poster alluded to. I remember Tom asking John after one of his songs “John, you started dancing even before the music started” and John replied “Guess my pants are too tight”. By the time American Fool came out, I had worn out copies of both of his two previous albums. I remember taping John’s Lincoln Nebraska concert off the radio in August of 1982 (the one that starts with “30 Days In The Hole”). I also enjoyed listening to John on the Rockline radio show with Bob Coburn back in those early days. Although John’s hits from American Fool made him “big”, I certainly was not surprised by any of his later success because, to me, he was a star from the very beginning. Uh-Huh, Scarecrow, Lonesome Jubilee, Big Daddy, all of them were truly wonderful. I really enjoyed the 2 hours that Bob Costas devoted to John on his late night show "Later" circa 1991. My favorite semi-recent album of his is Cuttin’ Heads. I have always loved John’s references to Paul Newman movies (Cool Hand Luke and Hud) in his lyrics. I remember John playing live in Manhattan his new songs from Cuttin’ Heads on NBC’s Today show the week before 9/11. Summer of '81 one of my older brothers came home from college and threw an album on my bed and said "when you finally get a gal in bed, put on side one. trust me" I instantly became a Cougar fan. The album was "Nothin' Matters and What if it did. To this day if I had to pick a favorite album/cd that would be it. I can even remember playing the song "Tonight" from that album to friends in high school and one of my friends replied "that's the story of my life!" Hope everyone is having an awesome day and ROCK ON !! The album is still in print and available at online stores like Amazon.com and should be available for order at any local record store, I believe Best Buy will still order titles in for a customer. Additionally it is available for MP3 download through online music stores such as iTunes, AmazonMP3, Google Music etc. Time is an illusion, so I heard the CT for the first time just a few seconds "ago" when I listened to "Smile" and "Half-Gifts." But in that swampy thing called The Past, I guess I heard them . . . in order to be so all-fired in love with them now -- or not. Here is a page from my JCM online tribute photo gallery of John on Tom Snyder show.